A private pilot has no limitation on the size of aircraft or the number of passengers you can carry if you are rated on that aircraft. With additional training you can fly a sea plane or inside the clouds or fly a multi engine aircraft. You can fly longer distances for weekend jaunts to visit friends or sightseeing flights. Many choose to learn aerobatics for fun and others learn to fly their own home built aircraft. Some pilots go on to build a career in aviation, or related fields. 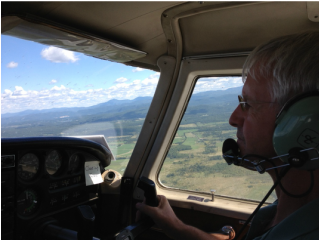 With a commercial pilot license you can get paid for the work you perform. Some people choose to get a recreational pilot license because it takes less time than a private pilot’s license. A recreational pilot requires 30 hours of training vs. 40 hours for a private pilot’s license and FAA exam. They have a distance restriction of 50 nautical miles from the departure airport. Three hours of cross country lessons from an instructor can remove this restriction. Recreational pilots also cannot fly to a tower-controlled airport until the restriction is removed with further training. They are limited to daytime flight, and carrying only one passenger. A private pilot does not have these restrictions. A recreational pilot can fly anything a sport pilot can fly, and can also fly a larger and heavier aircraft.